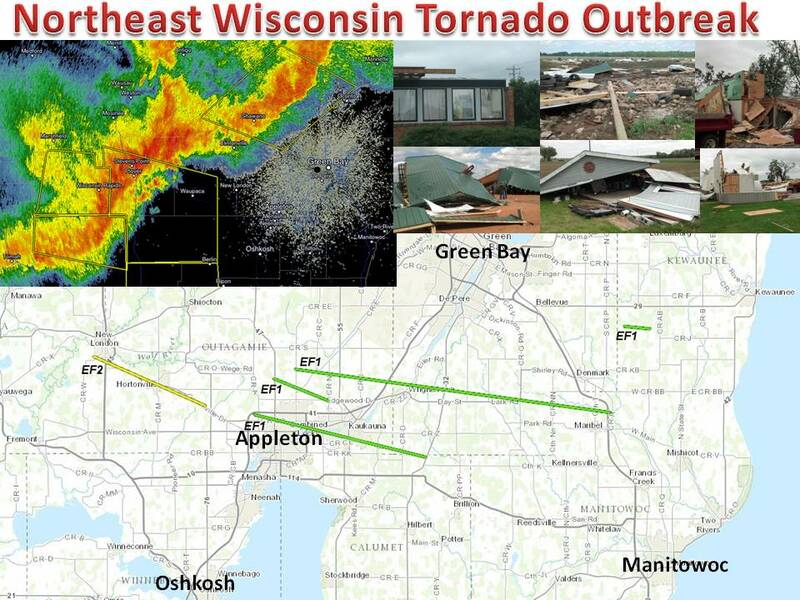 Mother Nature threw out a Major Tornado Outbreak in Wisconsin yesterday morning. A total of at least 5 tornadoes struck a densely populated area in northeast wisconsin Wednesday. The tornadoes were spun up ahead of a bow echo (see radar). These tornadoes are classified as mesovortex tornadoes, they occur when straight line winds get so strong a twisting motion gets going, acceleration takes over and you get a full blown tornado. Although somewhat rare, at least 5 have now been confirmed by the NWS. Given the velocity data, the real tally is likely well over 5! Each tornado recorded an estimate wind speed of over 100mph and were classified as EF1 or EF2. The National Weather Service will be out surveying again and may find more confirmation of additional tornadoes. Thanks for all the pictures everyone! Very well appreciated!